This plot shows the complete field above Sandrock, together with the plot of Sandrock itself, at the bottom of the picture (in the form of a T). The hedge line runs from left to right at the top of the indent. This is another sun relief map, but this time the data has been passed through a low pass filter a number of times, to accentuate the differences between low and high data readings. A number of features have been accentuated, in particular the northern and eastern sections of the fort perimeter. Close study shows a ditch running from south-east to north-west. This is very obvious where the ditch has been cut through the deep soil in the north-east of the site. Further study of this data is required since there is also an indication that buildings may exist within the perimeter of the fort, on the western side. There are a number of regular lines which may indicate soil disturbance, but not necessarily architectural in nature. This will need further archaeological investigation. 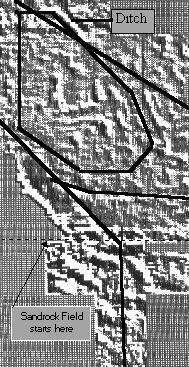 The lower section of Sandrock Field is interesting because there is an obvious feature in the shape of a large U. At this stage it is impossible to say with any certainty whether it is geological or man-made. The survey needs to extended into the complete field, since it currently occupies only about one third of the whole. When the rest of the data has been recorded it should be possible to form a judgement. Unfortunately the survey does not yet extend to the area of interest shown on the aerial photographs , which we studied (136) earlier.